Agni-VI with multiple nuclear warheads, which can reach targets 6,000 km away, is all set to be developed by the Defence Research and Development Organisation (DRDO). Only in April last, it carried out the maiden launch of Agni-V, which has a range of more than 5,000 km. So far, all the strategic missiles developed by the DRDO — Agni-I, II, III, IV and V, and the submarine-launched K-15 and its land-based version Shourya — can carry only single nuclear warhead. The DRDO’s tactical missiles and supersonic cruise missile BrahMos can carry one conventional warhead each. Although the Union government is yet to sanction Agni-VI project, the DRDO has done all the enabling studies, finalised the missile’s design and started working on the engineering part. It had also figured out how to anchor four or six warheads in the vehicle, how to disperse them and the pattern of their dispersal. The warheads could be released in an order, one after another. If one warhead were to hit a place, another could fall 100 km away from it, the technologists said. Both Agni-V and Agni-VI have three stages, all powered by solid propellants, and their diameter is two metres. And the comparison ends there. While Agni-V weighs 50 tonnes and is 17.5 metres long, Agni-VI belongs to the 65-70-tonne class and will be 20 metres long. 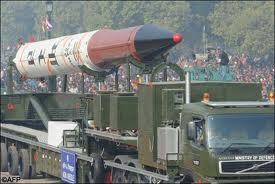 “Agni-VI will be a massive vehicle,” the technologists said. It was too early to say when its first launch would take place. It would be road-mobile and blast off from trucks with launching platforms.